Marketing does not just happen. Products and services need to be developed carefully to ensure that they reach the consumer in the right way at the right place, time and price to lead to customer satisfaction and resulting profit to the supplier. This requires planning! The marketing plan is the result of all the planning that is required throughout the marketing process. But how to write a marketing plan? This article provides you with a clear framework for writing the perfect marketing plan. It may be very tempting for young companies or entrepreneurs to rush off to market a new product or service. The planning stage is often partly or completely skipped. When things go wrong afterwards, the cause is often the same: a lack of preparation and planning. The business idea will be very unlikely to be successfully implemented, which causes loss of face, time and money. This can be prevented with a good marketing plan: It is better to sit down and plan carefully before getting off to entering the market. All marketing planning comes together in the marketing plan. The marketing plan is a highly important framework that provides certainty in the potential of the product or service and a roadmap for the implementation. When asking how to write a marketing plan, you often get differing answers. Hence, there is no absolutely fixed definition of what needs to be included and what not. 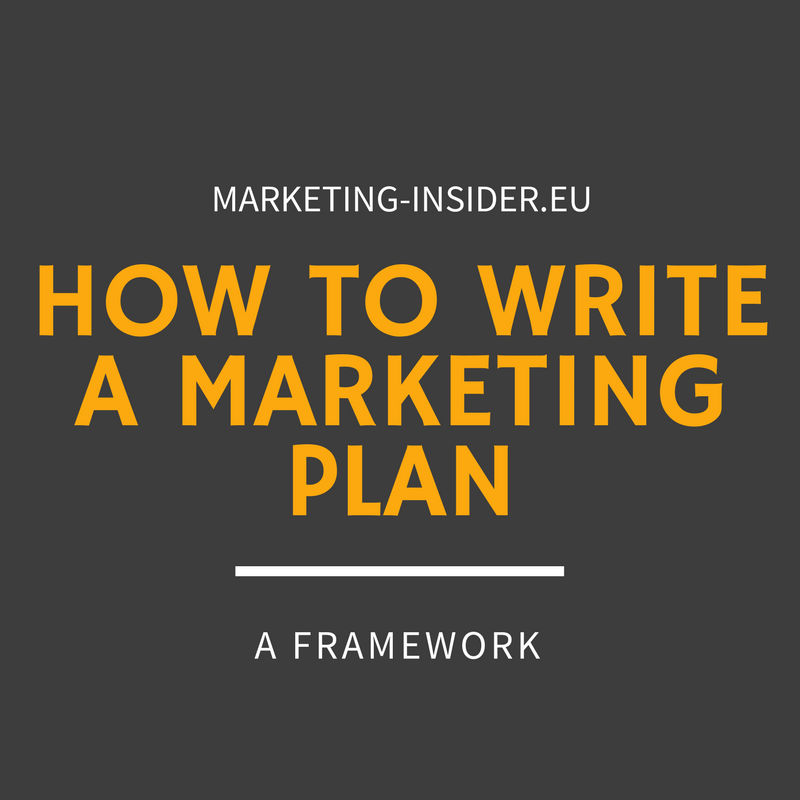 However, if you follow this framework for writing a perfect marketing plan, you will learn how to write a marketing plan – not any marketing plan, but a perfect one. In essence, the marketing plan shows the direction that the marketing mix is expected to take. It gives estimates of crucial success factors such as customer demand in terms of market size and growth, competitor activity, opportunities and threats in the market environment and how outlines the plan for responding to these factors with the right strategies. We will now go through the elements of the marketing plan step by step. This will provide you with an overview of how to write a marketing plan in terms of contents and structure. The business mission is a statement encompassing the whole operation, often following a general goal, for instance to be ‘market leader’ or ‘the most innovative supplier of goods and services’ within a selected industry. The environmental audit aims to investigate the market environment in which the firm operates in terms of Political (including legal), Economic, Social and Technological (PEST) issues. This can be extended to include the DEPEST factors, also called DESTEP or PESTLE factors. 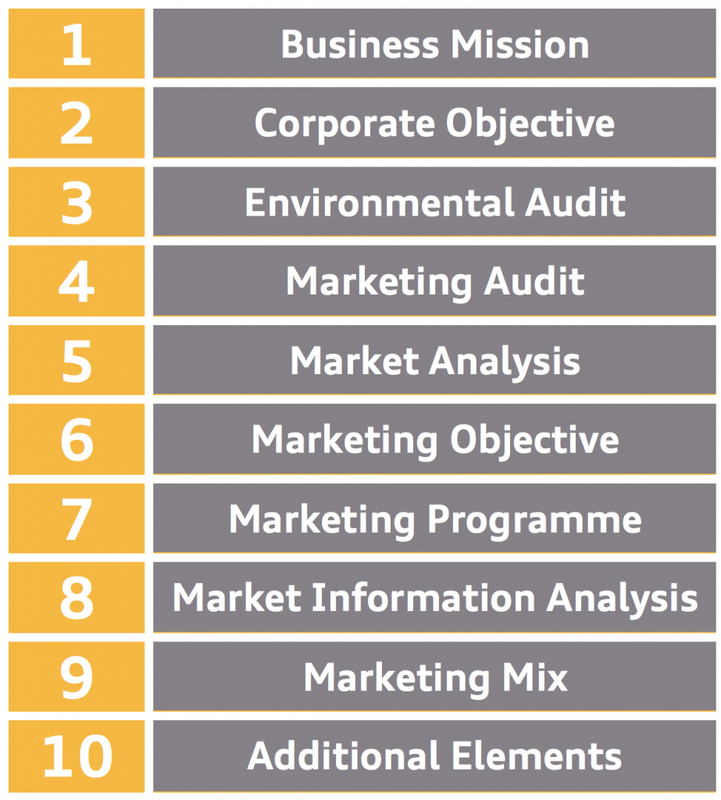 The marketing audit is an analysis of competitor activity, providing the relative position of the company within the market. It involves undertaking a SWOT analysis covering the firm’s internal strengths and weaknesses as well as external opportunities and threats. The market analysis involves an assessment of market size, trends and segments; regional and local market characteristics; seasonal variations in sales, etc. In this part, the company needs to define objectives in terms of forecasts of increased sales, customer awareness, channel coverage for the product or service and so on. Corporate strategies relate to the analyses of environmental and marketing audits discussed above and provide a roadmap for how to address these issues. The marketing programme addresses the implementation of marketing tactics to achieve the strategic objectives through the marketing mix, balancing product development, pricing, promotion and channels of distribution (place) decisions. The market information analysis is supposed to lead to the discovery of market gaps, new markets/segments, customer characteristics, product life-cycle positioning and targeting, etc. It incorporates developing the Marketing Information System (MIS), marketing research methodology and marketing research implementation. This may also include the selection of a marketing research agency, if appropriate. Assessment of product characteristics, range, features; sales trends, performance history and planned developments. Assessment of positioning strategy and customer-perceived values. Assessment of media advertising, direct mail, sales promotions, sponsorship, exhibitions, public relations, selling activity and measurement of communication effectiveness. Assessment of channel strategy, channel selection, selling strategy, sales plan and sales force organization. Constraints within which the plan has to operate. Marketing budget, revenue and gross margin forecast, target marketing ratios and cash flow projection. Scheduling of proposed marketing activities within the plan (often portrayed using a Gantt chart). Personnel requirements for implementing the plan, including appropriate recruitment and training.